Less than sixty seconds after the opening bounce, the blue and white army already had something to cheer about. Setting the stage, Ashlee Atkins immediately kicked off proceedings by executing a perfect set shot on goal. East Fremantle’s speed, tackling intensity, composure, kicking efficiency and second efforts were phenomenal, and they looked virtually unstoppable early on. Roxanne Roux kicked their second, and while the Sharks’ dominance and ability to lock the ball inside 50 was telling, they weren’t without their challenges. With Subiaco limiting their opponents to just the two majors in the opening term, the Lions weren’t giving up without a fight. Eventually finding an avenue up forward, the Lions finally hit the scoreboard five minutes into the second quarter with a goal from Mckenzie Dowrick. In the highest scoring quarter for the game, the Sharks immediately responded when Atkins kicked her second. Amy Lavell then sealed a contested grab and kicked her first major to cull the Lions back to within a kick of the lead. Running into an open goal, Belinda Smith answered the call and stretched East Fremantle’s lead back out to 12. While the game had turned into a ‘see-saw’ like affair of epic proportions, East Fremantle managed to still benefit from a handy two goal buffer at half time. Kicking two goals to nil in the third term, Subiaco certainly gave the Sharks something to worry about. Courtesy of a textbook banana snap around the body, it was Lavell who got the maroon and yellow faithful out of their seats with a goal that gave Subiaco the lead by a single point. At the final break, scores were level. It was game on. Having not kicked a single goal since the second term, East Fremantle were looking for answers. Missing two shots on goal in the opening 10 minutes of the final term, Subiaco found themselves holding onto a two point margin with half a quarter to play. Amongst the best on ground, East Fremantle’s Sharon Wong threw herself at virtually every contest. Consistently at the bottom of packs, running hard and repelling many of Subiaco’s attacks on the football, her poise and influence helped place East Fremantle in positive stead all afternoon. Roxanne Roux had a massive impact in the final term. Taking intercept marks around the ground, her strength in each contest was huge. As the clock dwindled down, Sprlyan provided the x-factor East Fremantle needed. Finding herself in front of goal with seven minutes remaining, she took charge and kicked a goal to give the Sharks back the lead. Courageously going back with the flight of the ball, East Fremantle’s Julie-Anne Norish took an intercept mark deep inside defensive 50 to save East Fremantle just minutes from the final siren. While her efforts were match-saving, Norish was carried from the ground with a potential leg injury. With the last 30 seconds played on Subiaco’s 50m arc, stoppage after stoppage halted any prospect of a comeback. Holding on to win their first flag since 2011, the five point win and premiership honours had East Fremantle colours written all over it. 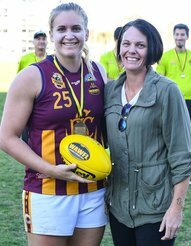 Deservedly taking out Lou Knitter Best on Ground honours, Danika Pisconeri (pictured) delivered a stellar performance in the ruck for the Lions. Keeping Subiaco in the race all day and making a huge difference, she successfully sent the ball down the throats of her teammates all afternoon. Speaking after the game, East Fremantle Coach Nikki Harwood said they had expected and prepared for a tight game against the Lions. “Subiaco are such a quality outfit - they’re hard and tough. I was never convinced we would come out and win this without a fight,” she said. “The dedication, hard work and discipline (the squad has shown) from November to now has paid off. EAST FREMANTLE: Ashlee Atkins (2), Kahra Sprlyan (2), Roxanne Roux, Belinda Smith. 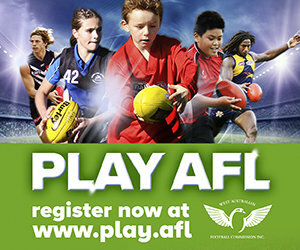 SUBIACO LIONS: Mckenzie Dowrick (2), Amy Lavell (2), Ashlea Renshaw.